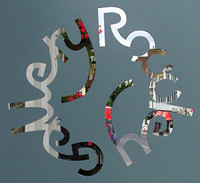 A short walk from Annely Juda’s in Dering Street, north across Oxford Street to Cavendish Square, west along Wigmore Street to Manchester Square, and to Hertford House, home of the Wallace Collection – a national museum which displays the art collections brought together by the first four Marquesses of Hertford and Sir Richard Wallace, thought to be the illegitimate son of the 4th Marquess. It was bequeathed to the British nation by Lady Wallace, Sir Richard’s widow, in 1897. 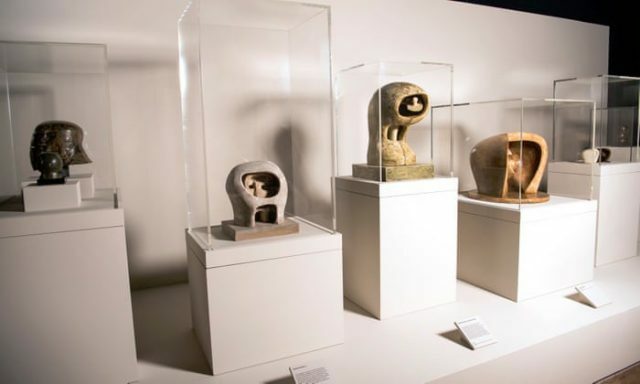 There’s a fascinating exhibition in the basement – Henry Moore: The Helmet Heads. 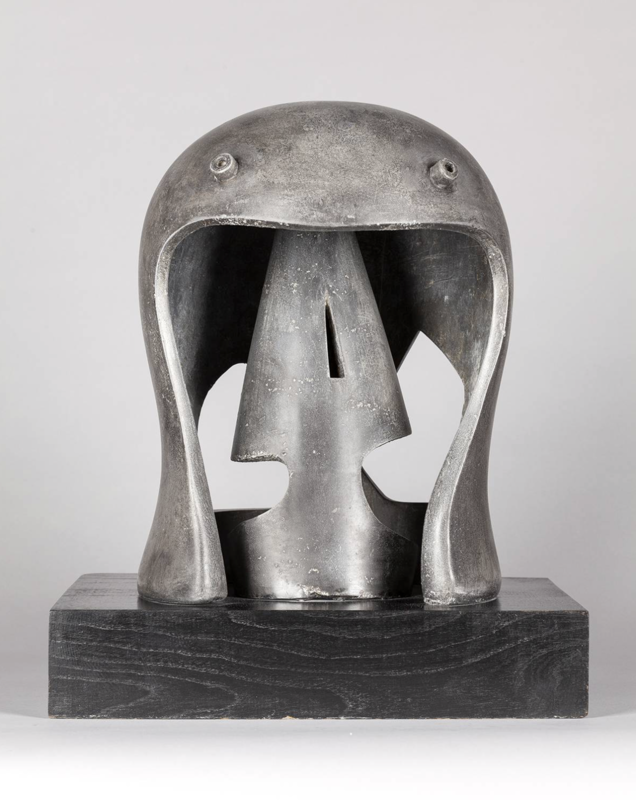 In the perspective of Moore’s later work, the most significant of the lead figures was a small ‘Helmet’, completed in January 1940 and bought before long by Roland Penrose. 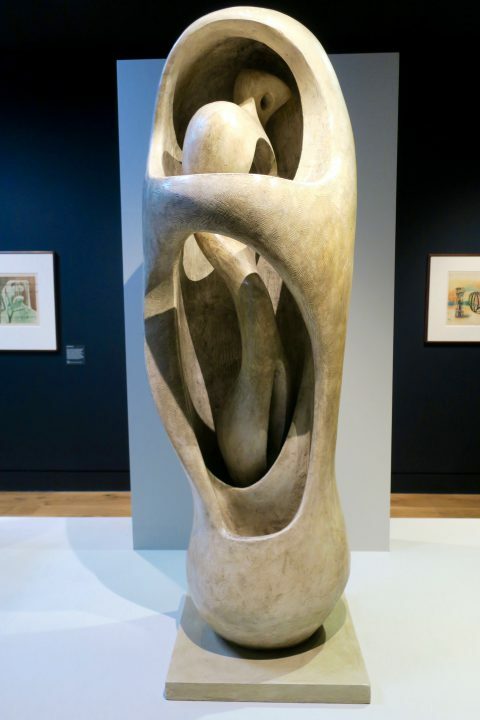 It was the first of Moore’s works in which an outer figure contained an inner one. 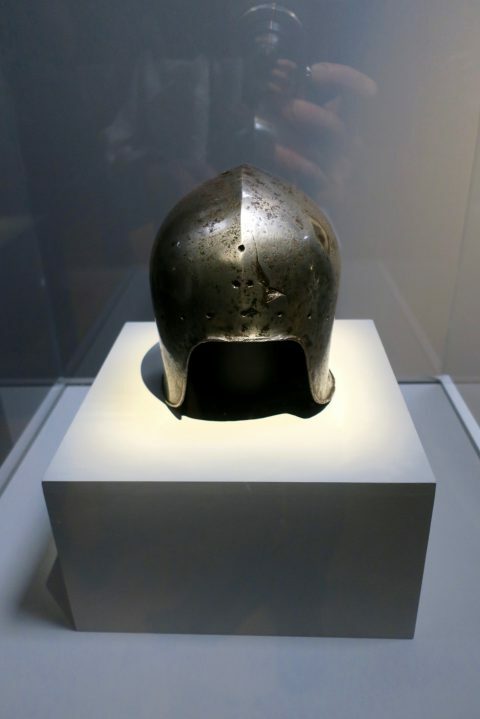 The helmet itself is womb-like and slightly sinister, and it is hard to say whether the nervous, spaghetti-like creature within is being protected or imprisoned. With overtones both of war and of the mother and child theme, it is very Moore-ish in its rich and many-layered suggestiveness. 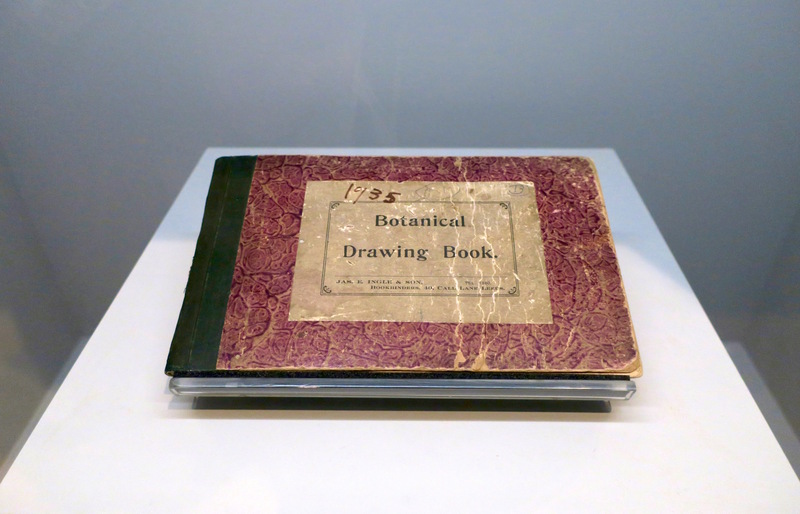 This sketchbook is full of rapidly executed drawings of heads, masks and objects Moore encountered in museums. 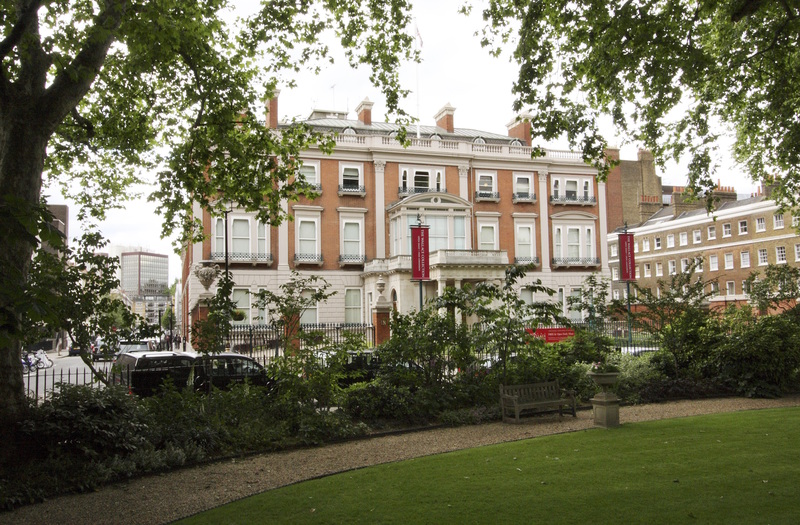 Dating from the early 1930s, it is likely Moore also used it on his visits to Hertford House. Its contents show Moore evolving his ideas about internal and external forms and helmets. 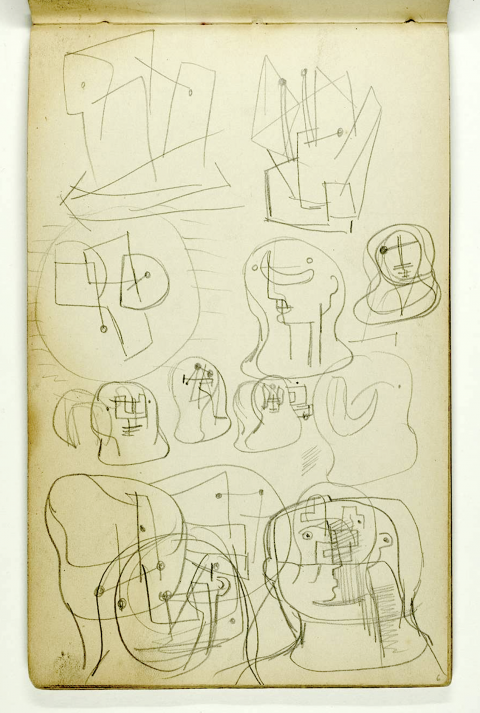 These sketches and notations were later refined into more complete drawings and sculpture. 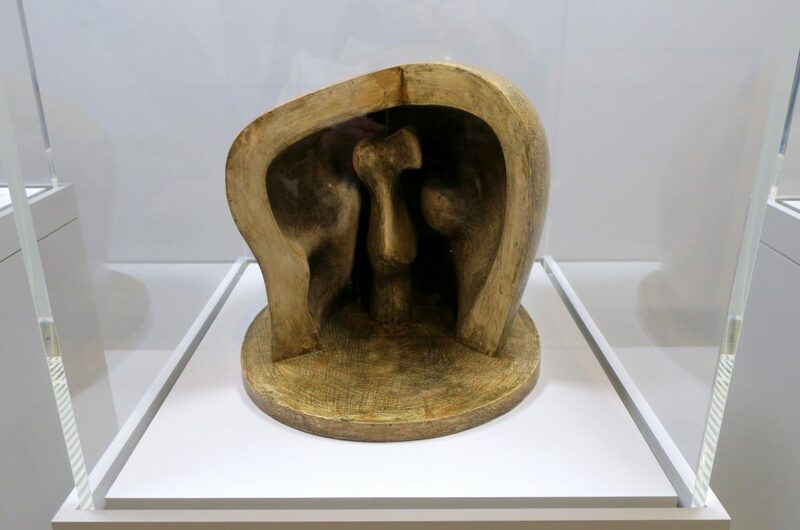 Essentially a slender, crested helmet, ‘Figure’ was made at the same time as drawings meditating on the sculptural possibilities of helmet-like forms. It is also contemporary with ‘The Helmet’ (1939-40), Moore’s first three-dimensional treatment of the internal-external helmet idea. 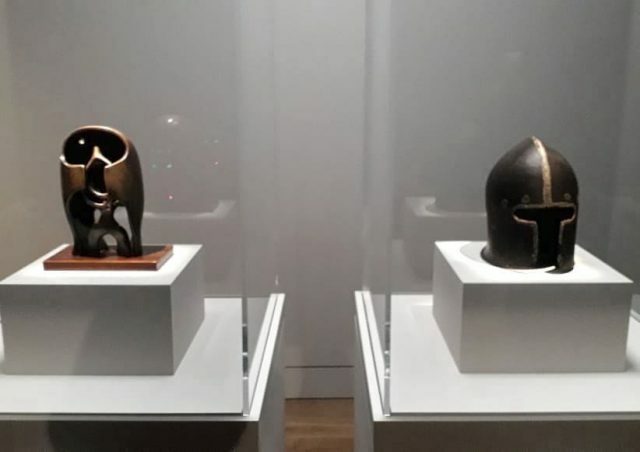 By 1934, Moore had begun to synthesise his ideas about armoured and sculptural heads. 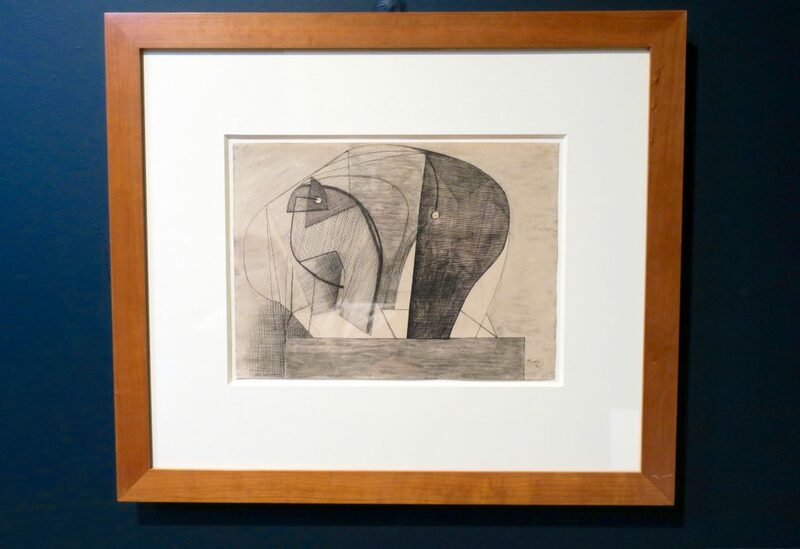 In this drawing he uses lines in the same way that he was employing strings in his sculpture, to allow one shape to be visible through another. 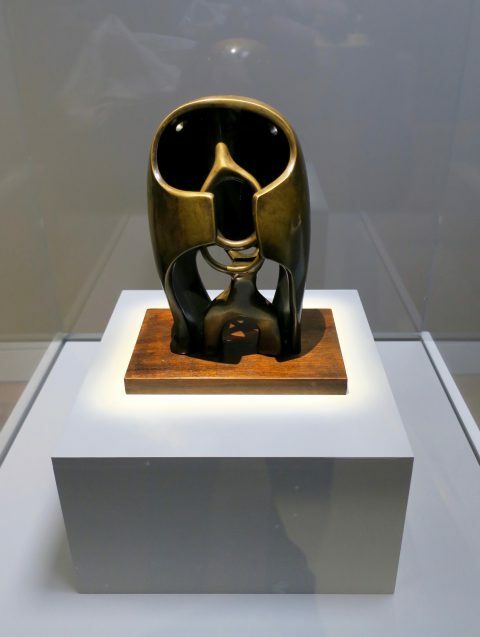 The internal spaces of the head are considered – a precursor to ‘The Helmet’ five years later. On an impressive scale, hard plate armour here morphs into a fleshy uterine pod. In contrast to armour, the carapace is elastic, its shape determined by forces within, an embryonic figure. In its upright orientation, Moore noted an affinity between these forms and seed pods and the stamens of flowers. Nonetheless, the urgent need to protect the precious, fragile form inside is strongly expressed. 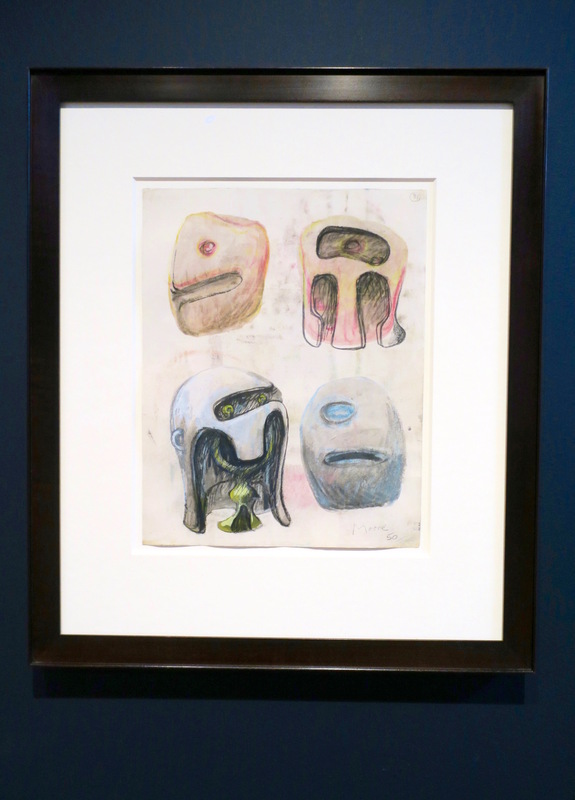 This drawing represents the pre-war synthesis of what Moore would later call the ‘Helmet Head’ concept. Each helmet, derived from studies in the Wallace Collection, contains a fragile inner form – protected, imprisoned, or perhaps both. 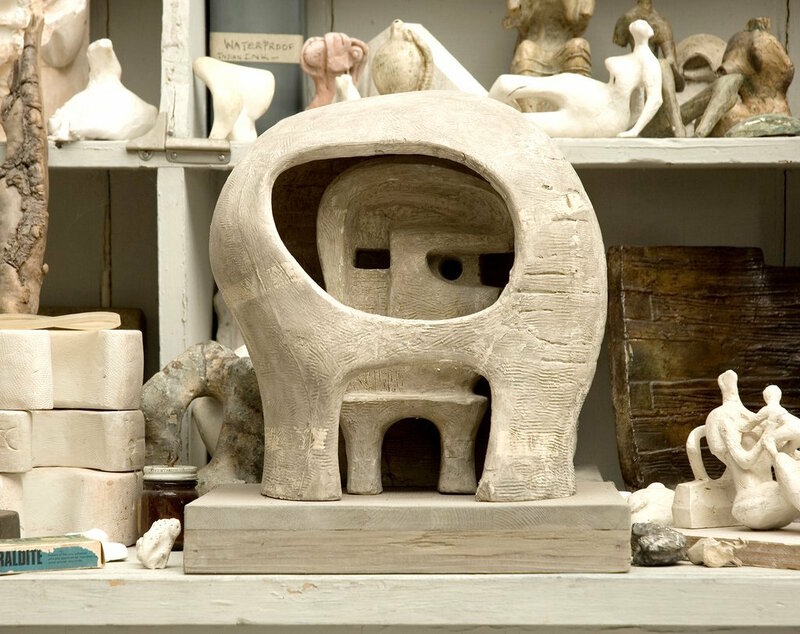 In the middle of the bottom row is the design Moore chose to translate into his first sculpture on the theme, ‘The Helmet’ (1939-40). 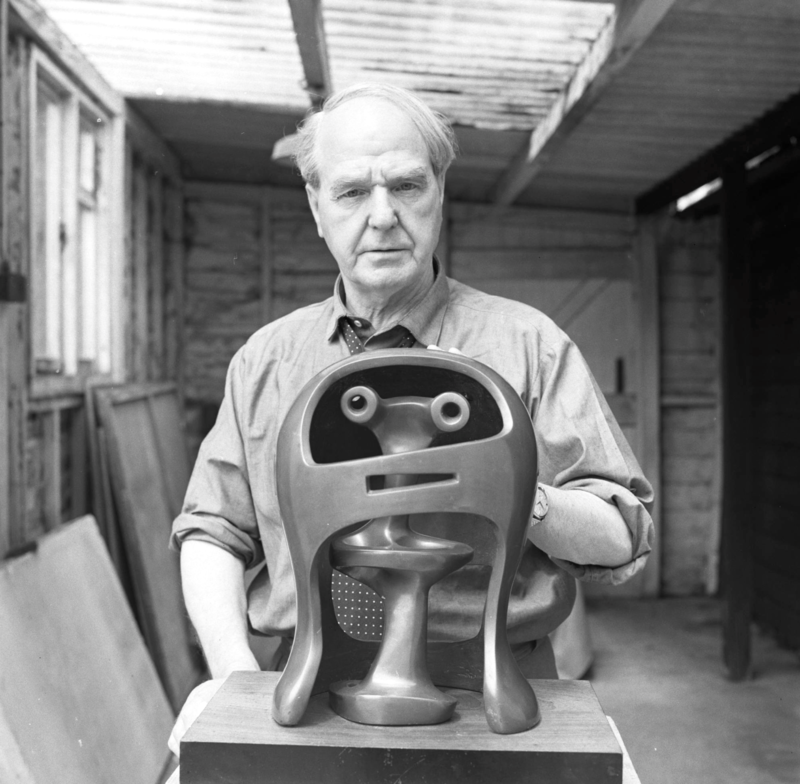 In 1950, Moore made his first two sculptures entitled ‘Helmet Head’, thus beginning the numbered series. 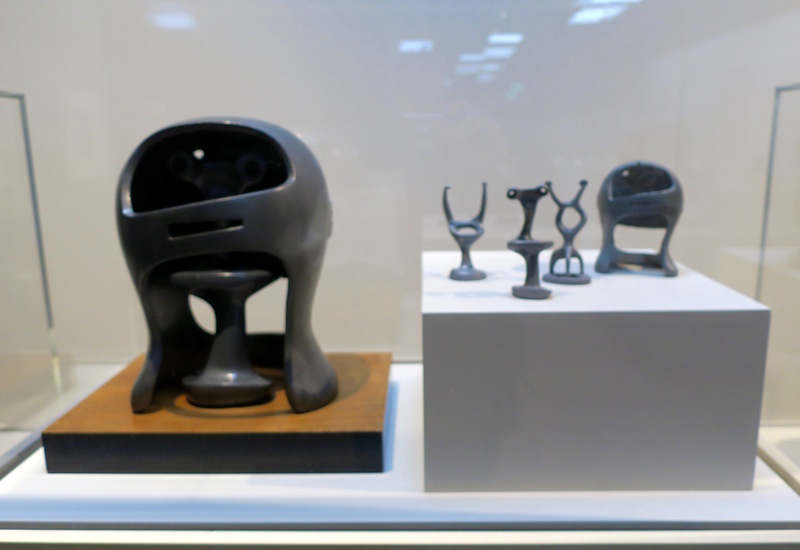 These originated as small maquettes which Moore cast in lead. He made these in separate parts, exterior helmet-shells and interior figures. 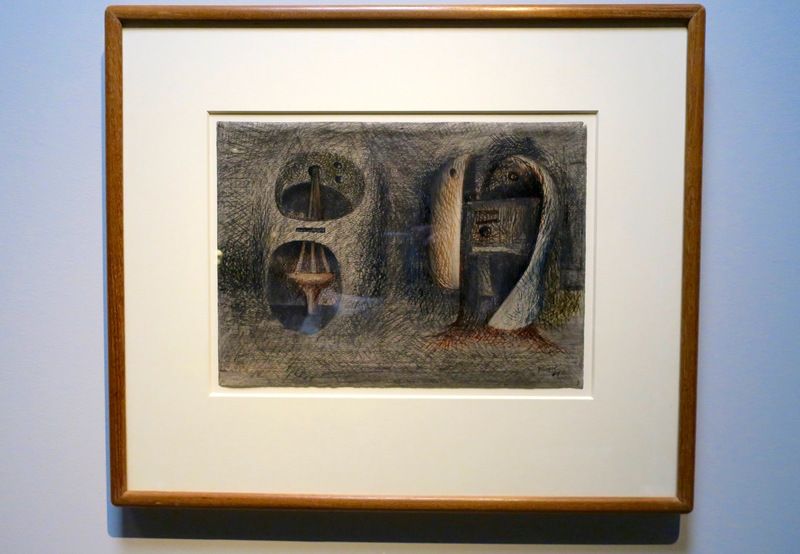 He could then experiment with different combinations of internal and external forms. This practice echoed the variations in his drawings. Five interior figures once existed, but only three survive. Once Moore had decided on a pairing of two elements, he created an enlarged model from which a sculpture in lead or bronze could be cast. 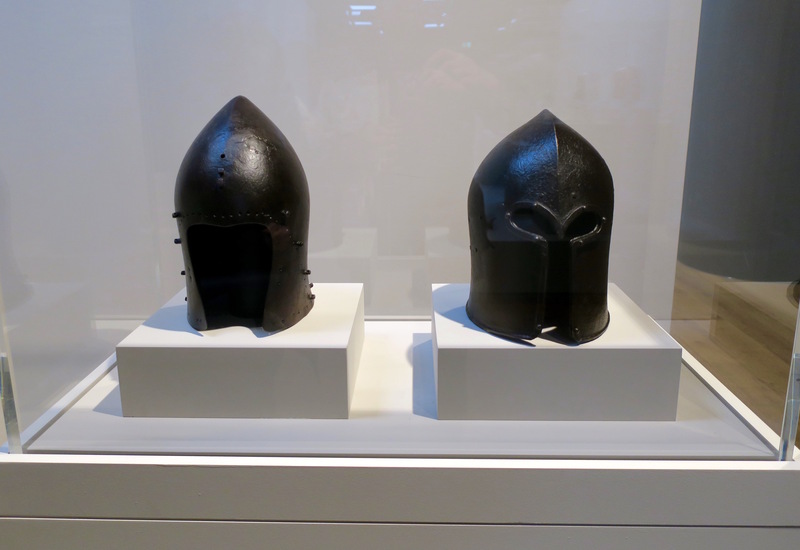 For every helmet idea realised in three dimensions, there were many others which only existed in two. 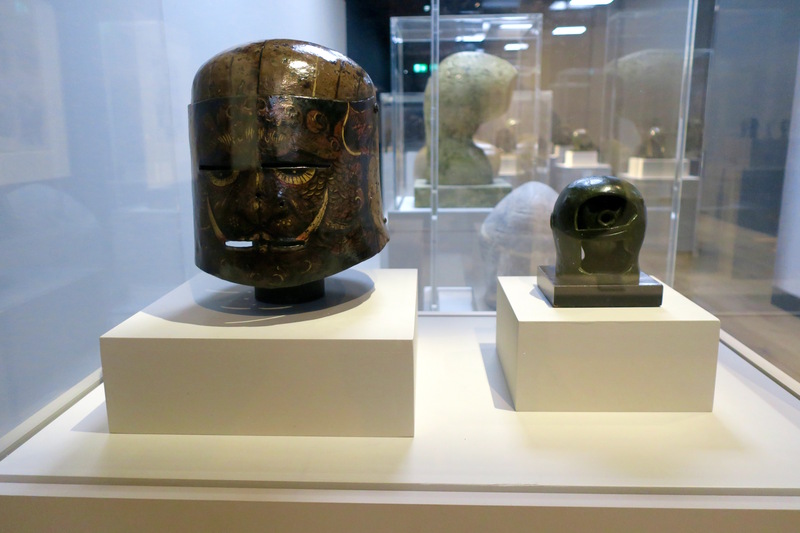 The figure in the centre of the top row is very close to the final form of ‘Helmet Head No.2’, while that at the right on the middle row is a near-final version of the idea for ‘Helmet Head No.1’. Others show Moore’s continuing interest in the barred or ‘stringed’ head idea, which ultimately was never incorporated into the Helmet Head series. 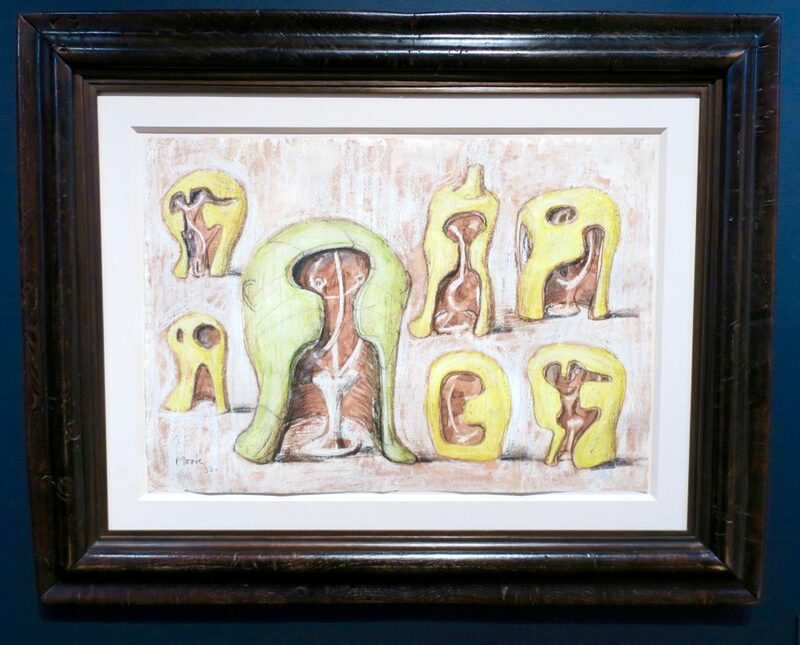 Moore developed his exploratory sketches into larger colour drawings in his studio. 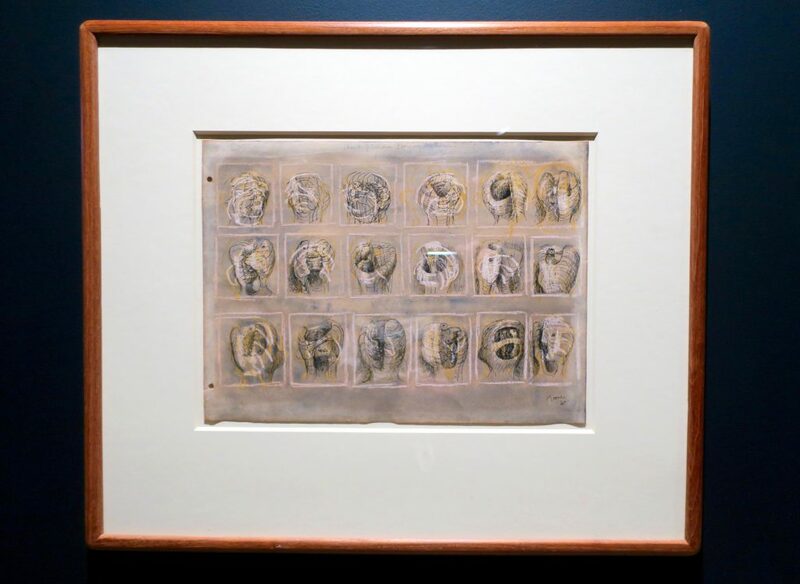 Through multiple variants on a page he could more fully realise three-dimensional forms and investigate the play of light. This work includes two iterations of the ‘Corinthian’ hemet idea. 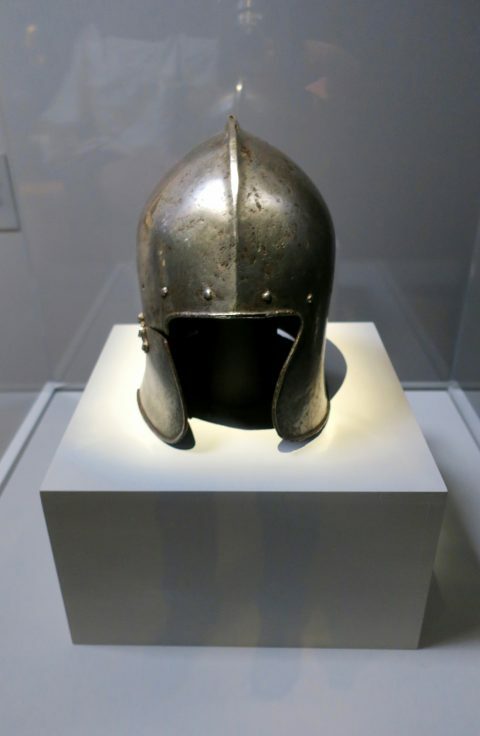 The lower left head may have been derived from a jousting helm in the Wallace Collection, which exhibits a similarly shallow, ridged skull and wide sight (vision slit). 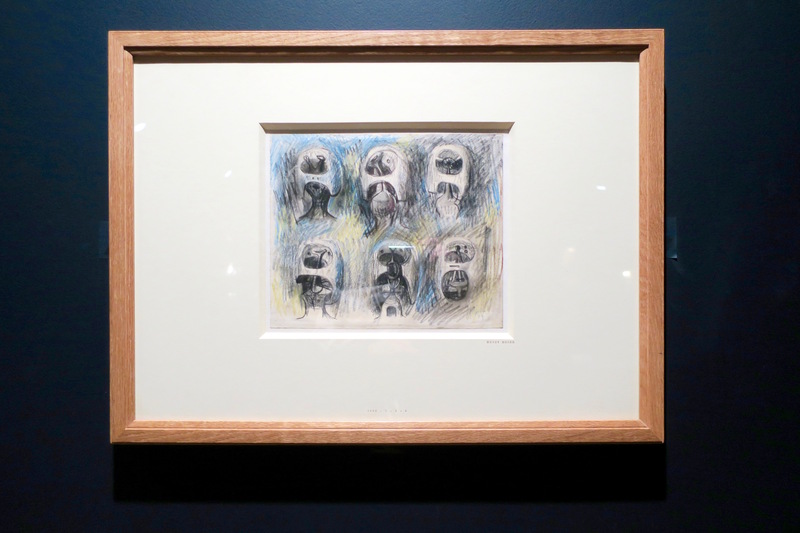 Created in the same year as the first two numbered Helmet Heads, this drawing reveals key aspects of Moore’s refinement of the concept. The negative space created by the ‘face-openings’ is as strongly evoked as the outer form. 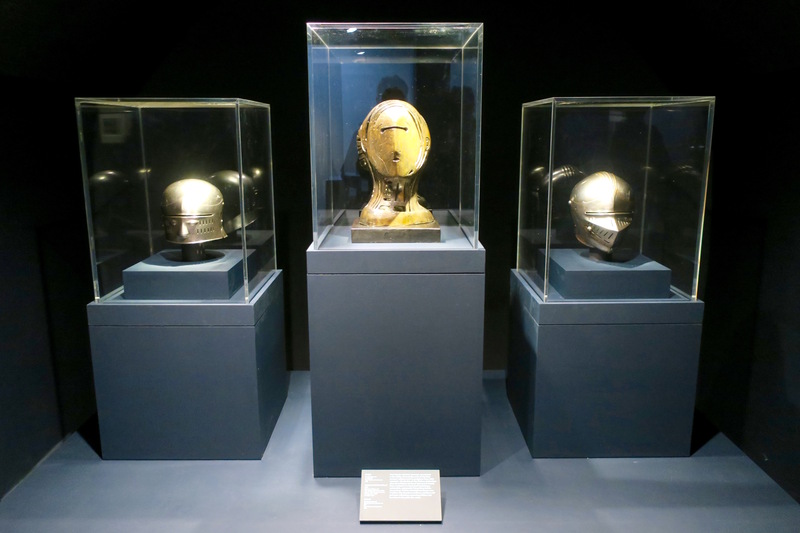 Four of the seven forms explore Moore’s idea of ‘stacking’ multiple face-openings, the original forms of which were taken from fifteenth-century helmets in the Wallace Collection. In the largest figure, a ‘T-face’ opening is placed above a rounded one – both have been taken from different historical references. Its original oil-painted decoration, depicting a tusked monster, means that this helmet is of exceptional historical importance. 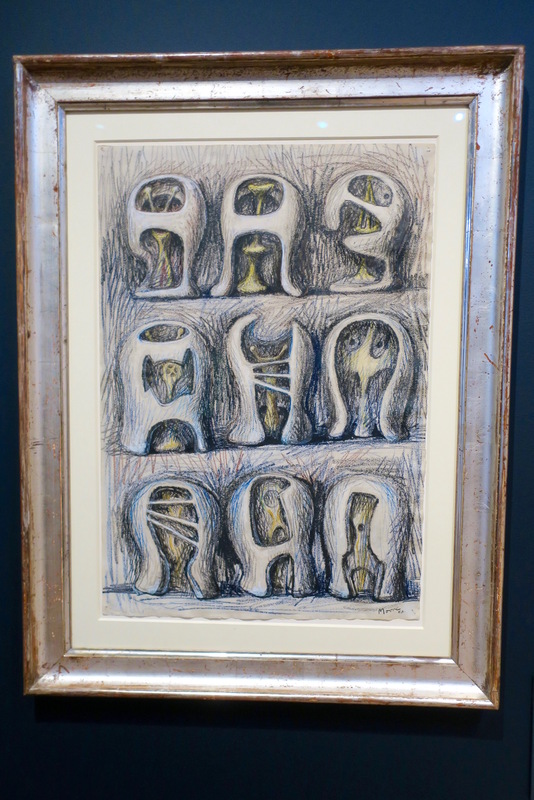 However, this is not what interested Henry Moore. 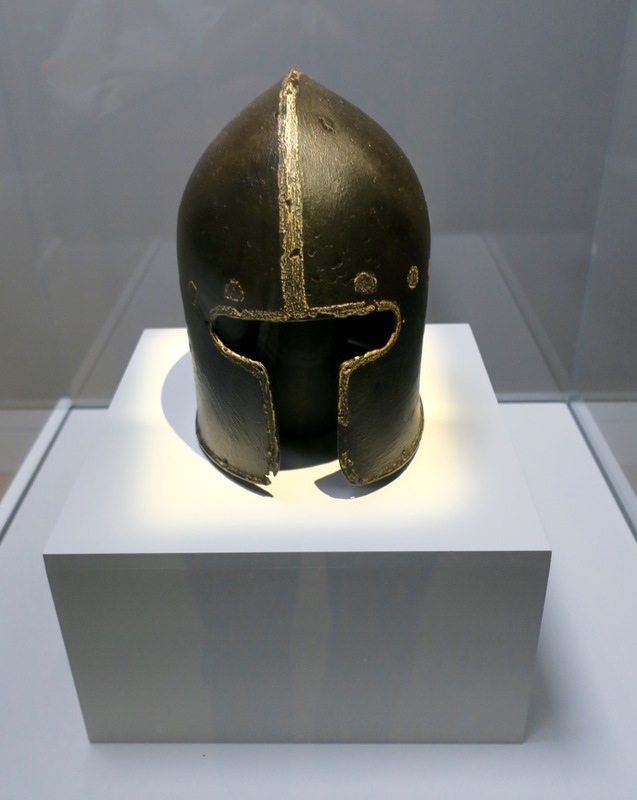 In an experiment realised solely by this small bronze sculpture, Moore investigated the potential of the stouter, squarish proportions of German helmets of this type. However, this approach seems to have been quickly discontinued. 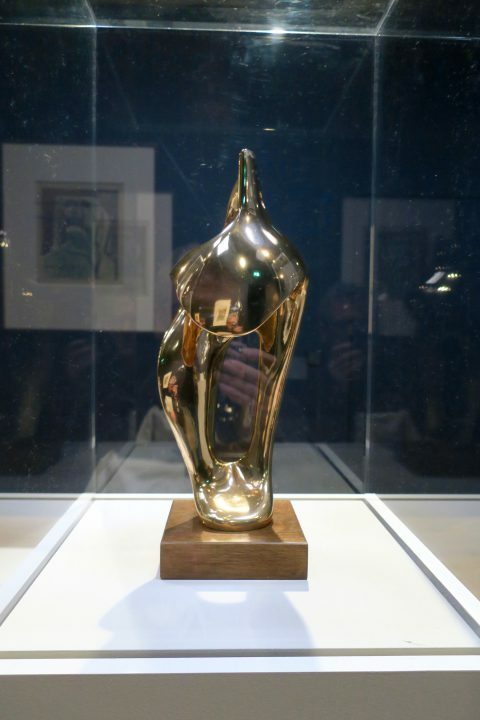 It was this point, just as we were approaching the culmination of the exhibition, that another head presented itself. With eyes closed and open-mouthed, the nodding head of the gallery attendant was just too irresistible. But as I raised my camera he suddenly jerked awake crying NO PHOTOGRAPHY! So, regretfully, the final few exhibits must remain a mystery. More reason to visit the exhibition and discover them for yourself – Henry Moore: The Helmet Heads. 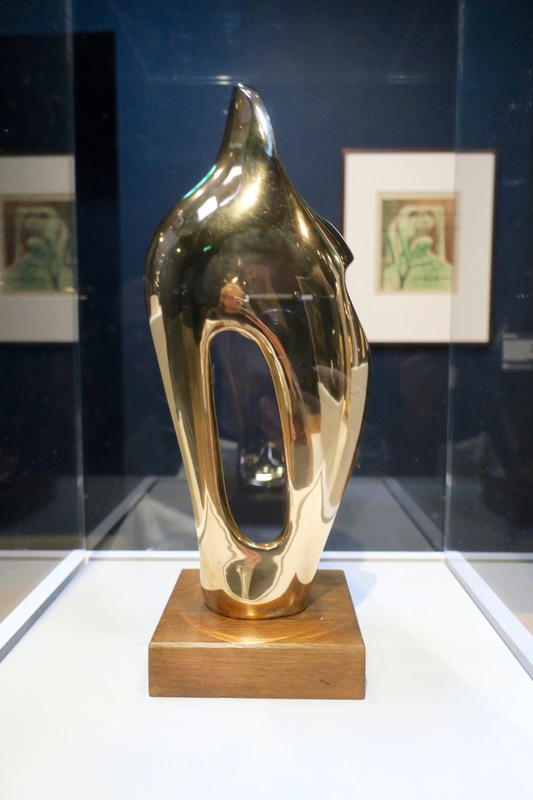 This entry was posted in Art and tagged Helmet Heads, Henry Moore, Hertford House, Roger Berthoud, Wallace Collection. Bookmark the permalink.